Philippine Nedo Kagyu Bodhi Dharma Foundation, Inc. Philippine Nedo Kagyu Bodhi Dharma Foundation, Inc.
White Tara is a bodhisattva who embodies the female aspect of the universe. She is often referred to as the Mother of the Buddhas of the ten directions and three times. She represents virtuous, enlightened activity. She sits on her lotus throne in the diamond lotus position with both legs folded under her, feet turned skyward. Her color, symbol of purity, wisdom, and truth, is the brilliant white of a thousand autumn moons. Her beautiful face and charming smile radiates five-colored lights. She has a third eye on her forehead and an eye each on her hands and feet. Together, her seven wisdom eyes symbolize her vigilance as she watches over all beings in all realms of existence with heartfelt compassion and clear-sighted wisdom. Her right hand is in a wish-granting gesture and her left hand is in the mudra for protection. In this left hand, she holds the stem of the uptala, a lotus, with three blossoms. One lotus is in full bloom, the second a bud ready to blossom, and the third a seed waiting to sprout. Together, the three symbolize all the Buddhas of the past, present, and future. She wears a skirt with five colors and is adorned with precious, brilliant jewels. Her special quality as a bodhisattva is her swiftness in responding to the prayers of those who call upon her, who chant her mantra, and practice her sadhana. One story tells of how Chenrezig, the Bodhisattva of Compassion, at one time was so moved by the suffering of all sentient beings that he shed two tears. The tear from his right eye turned into the form of Green Tara while the one from his left turned into White Tara. Another story tells of a young princess who lived millions of years ago in a different world. Her name was Yeshe Dawa, “Moon of Primordial Awareness”. For aeons, she made offerings to the Buddha of that world and in turn received teachings from him on awakening bodhicitta, the awareness of an enlightened mind. In time, a group of men approached her and, because of her level of attainment, suggested for her to pray to be reborn as a man in order to progress even further. She replied that the distinction between male and female only exists in the unawakened mind and that, from the perspective of Enlightenment, gender is not an obstacle to attaining Enlightenment. Saying this and acknowledging that few who work for the liberation of all from suffering take the female form, she resolved to take the form of a female bodhisattva until all beings are liberated from suffering. The practice of White Tara is specifically designed to develop wisdom and to overcome the four inner maras or obstacles, namely incorrect views, negative emotions, untimely death, and being stuck in the bliss of meditation. Meditating on Tara is said to enable practitioners to quickly achieve liberation from suffering and attain enlightenment. Ayu means “long life”. Punye and Jana are the two accumulations. Punye means “merits of living an ethical life” and Jana means “wisdom”. These two accumulations together enable those following the Buddha dharma in developing bodhicitta and, ultimately, attaining enlightenment. Puting means “wealth and abundance”. Mama, which means “mine”, indicated the practitioner asking for the abovementioned blessings from Mother Tara while Kuru implores Tara to “Make it so!” Soha, a common ending to Buddhist mantras, is an exclamation and salutation hailing the deity of the mantra. 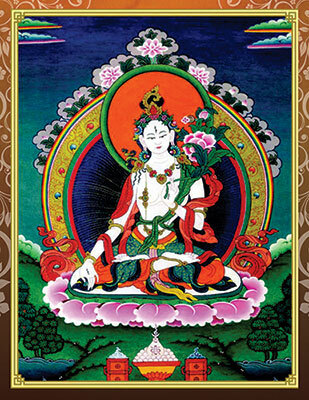 White Tara helps practitioners achieve the two siddhis. The first is the attainment of longevity, health and wealth. The second is the attainment of Dharmakaya, the truth body of Buddha. Receiving the White Tara empowerment means a practitioner is connected to the enlightened energy of White Tara. This gives empowered practitioners direct access to her blessings and gifts. It allows them to develop aspects of the enlightened consciousness specifically associated with White Tara and grants them her refuge and protection while one is on the path to enlightenment. As with all Vajrayana practices, the relationship between deity and practitioner always goes both ways. The deity, in this case White Tara, gives her blessings and her aid. The practitioner, in turn, gives his or her commitment to practice regularly with the intention of ultimately gaining liberation from suffering in order to consequently aid all other sentient beings in attaining the same state of Buddhahood. Booklets will be available for distribution at our center during the visit of Ven. Nedo Rinpoche. Please visit our Facebook Page or contact us for information on how to obtain a copy. We are now accepting donations. Please click here on how you can donate to our center. Lhabab Chorten Stupa located at Dasmarinas, Cavite. © 1996-2015 Philippine Nedo Kagyu Bodhi Dharma Foundation, Inc.